I am on the prowl now to find the best version of a Negroni that I can devise at home. I’m going to start by examining the gin. As we know, gin is a blend of neutral spirit and a mix of juniper and other aromatic herbs and spices. Some gin distillers push the juniper to the front, whereas others craft a spirit that’s more floral or citrusy. Which style of gin works best for a Negroni? I wanted to find out. Read more, at Serious Eats. I find that it’s easy to overthink the simple things. For example, I work from home while caring for two small children. Jeans and a black t-shirt are now my daily uniform at home. Why buy button-downs and polos and sweaters just to wear at home, when they’ll just get jam and drool and Angostura on them anyway? It’s also all too easy to overthink the home bar, and to assume you need to spend a couple hundred at the Liquorteria just to get started. Here are some tips on the essentials you really need. Food & Wine’s Mouthing Off reports today that Plymouth plans to introduce its sloe gin to US shores next year. Just a quick note about this: since many of you met LeNell Smothers at Tales of the Cocktail this year, I wanted to put it out there that she’s lost the lease for her store in Brooklyn and is looking for a new storefront. She has to vacate by next summer. It might seem that 10-12 months is a long time, but when you have to find and possibly renovate a new location, that’s a crunch. The Times has the full story. I meant to link out to this earlier, but the week got away from me. She runs one of the best liquor stores in the whole damn country, and she’s a great person to boot, so keep her in your thoughts. In this week’s “Shaken and Stirred” column in the Times, Jonathan Miles looks at the Manhattan cocktail, its origins, and its ingredients. Now, I’ve often heard that rye is the traditional backbone for the Manhattan, and that’s certainly the way I prefer them, but I never knew why rye is the tradition. Prior to Prohibition, rye was the prevailing whiskey in the Northeast but because so many distilleries shuttered during the dry years, rye fell out of favor. It seems logical, therefore, that rye was the go-to spirit in such cocktails as the Manhattan. Erenzo and his partner, Brian Lee, have just released a new spirit, Hudson Manhattan Rye, a 92-proof bottling made solely of rye. Because Erenzo and Lee developed this bottling to work well in a Manhattan, Miles also provides LeNell’s recipe for a Perfect Manhattan, with a couple of ounces of rye, a half ounce each of sweet and dry vermouth, and some orange bitters. 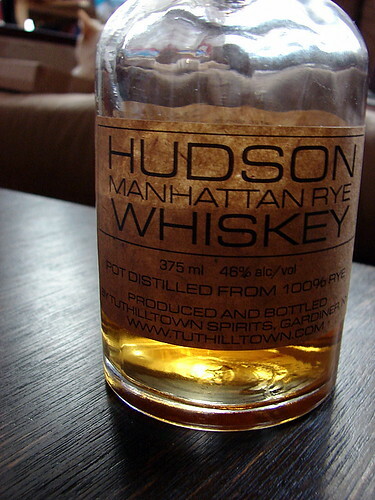 She used this formulation to best bring out the character of the Hudson Manhattan Rye. I was lucky enough to acquire a bottle this weekend, although I initially balked at its price tag–$40 for a 375-ml bottle. But on a per-ounce basis, I’ve paid more for spirits and not been as satisfied. I’m still developing my palate enough to provide tasting notes, and I’m not always confident about describing a spirit’s aromas and flavors to other people, but I will say, this stuff is peppery and spicy. It might be the most rye-tasting rye I’ve had. It’s so delicious, in fact, that I was initially saving it to be a special-occasion sipper, but after reading this article, I had to try the Manhattan recipe. I had Carpano Antica sweet vermouth (which I love), Noilly Prat dry, and some orange bitters I picked up at Marlow & Sons. Delicious. Maybe the best Manhattan I’ve had yet. Who cares about vodka? If it’s not the most boring spirit on earth, it’s damn close anyway. Since most of them are designed to be clean and flavorless, I’ve never honestly seen much point to drinking it, except maybe in a bloody mary, or straight from the freezer, in a shot glass and downed quickly. My wife, Jen, used to be primarily a vodka girl, especially on the rocks with tonic water, which I think is probably the dullest drink around. After we hooked up, I started coaxing her in gin’s direction, and she’s pretty much thrown over vodka for good. But the wife and I are hosting a cocktail party next month, and we know we’ll have vodka drinkers, so we need to stock up. During our regular trip to LeNell’s, we asked LeNell for vodka recommendations, explaining that although we weren’t vodkaholics ourselves, we knew there were more flavorful versions available now, and could she recommend some? I mentioned in my MixMo post that we tried the pastis from Domaine Charbay, in California. Susan Karakasevic, a cofounder of Charbay, posted a kind and thoughtful comment, thanking us for sampling her family’s pastis. With her warm words in mind, Jen and I were inclined to pick up a bottle of Charbay’s clear vodka, thinking it might be a good introduction to the brand. LeNell agreed, telling us it’s a tasty vodka–viscous and not overly refined, so that it retains sweetness, character, and flavor. We took a bottle home and sampled it in a vodka martini. Now, I usually hate vodka martinis–I might as well drink icewater for all the flavor I taste–so I was a little hesitant. But I wanted to do right by the Charbay, so I mixed up two martinis with a splash of dry vermouth, stirred over ice. I wanted to get the pure flavor of the drink without the dilution that shaking brings. Jen wanted a lemon twist, and I wanted an olive, so I garnished accordingly and took the drinks out back. I have to say, these were delicious drinks. LeNell’s description was right on target–a hint of sweetness and viscosity, a slight burn, and a clean finish. Although Jen preferred her twist and I, my olive, we both sampled the other’s drink and agreed that either one works well. And as we learned this morning, it’s good in a bloody mary, too. We’ve definitely found our vodka for the party. Anyway, Gary Regan is so charming and fun in person. He discussed mixing techniques, cocktail ingredients, and bar equipment, all while mixing drinks and passing them out to the crowd. He started with the sidecar. He discussed his theory of mixology—how everything reduces down to several basic recipes. The sidecar is cognac, triple sec, and citrus juice. The margarita—tequila, triple sec, citrus. The kamikaze—vodka, triple sec, citrus. The cosmo complicates things, but only barely—citrus vodka, triple sec, cranberrry, citrus juice. This is a powerful idea, and Gary attributes it to Ted “Dr. Cocktail” Haigh. But whomever the originator, it’s an idea worth remembering—a strong spirit, a liqueur (or other sweetening agent), and citrus juice. The spirit is your base; so many of Gary’s recipes are in the proportion of 3-2-1. Three parts spirit, two of liqueur, and one of citrus. Add other ingredients, maybe some vermouth, an additional liqueur, but keep the spirit as the predominant flavor, and just experiment. On the subject of experimentation, Gary talked about coming down on the train to LeNell’s and thinking, Hmmmmmm, I love an aviation cocktail. (That’s gin, maraschino, and lemon juice—oh look! spirit, sweetening liqueur, and lemon!) Could you make an aviation with tequila replacing the gin? Well, why not try it. So he tried that with us. We got a Gary Regan original. He said, well, you know that lime is traditional with tequila, so why are we using lemon? It seems that one night he wanted an aviation but was out of lemon. He tried lime juice instead, and it was vile in the drink. Just doesn’t marry well to the maraschino apparently. So he mixed up this new drink and sampled a little. Not bad. Not bad at all. He poured up some and passed them out to the crowd, dubbing it the LeNell—which flattered and charmed the hell out of our hostess. And it’s a good drink. Jen doesn’t like the maraschino (Stock) that I’ve used for drinks, but Gary used the Luxardo, and she liked it. Her only quibble was that the drink might be better if were drier, with a bit more citrus. Gary overheard her telling me that and mixed up a bit more lemon and added it to her drink. He then said that a good bartender will, if he or she has enough time and isn’t in the weeds, remember a regular’s preferences and, for example, mix my drink with less lemon juice and Jen’s with a little more. And that’s Gary Regan. Smart, accommodating, charming, drinker-driven, and damn good behind the stick.